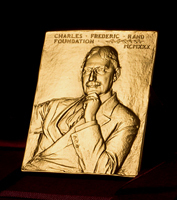 The Charles F. Rand Memorial Gold Medal was established in 1932 and is awarded for distinguished achievement in mining administration, including metallurgy and petroleum. Charles F. Rand was President of the Institute in 1913 and Treasurer from 1922 to 1927. Rand was a developer of mines and new processes in iron mining. He was President of several mining companies.